The 2019 Chevrolet Sonic may very well prove itself to be one of the most versatile subcompacts on the automotive market. Since replacing the Chevrolet Aveo in 2012, the Chevy Sonic has built itself firmly into the Chevy lineup. It is the only subcompact vehicle that is sold in North America to actually be built in the United States. Other vehicles in this class are manufactured in other countries, usually Japan. This subcompact, however, is as American as the Chevy brand itself. What makes the 2019 Chevrolet Sonic so versatile is that it comes in two different body styles: sedan and hatchback. When you combine that with the three different trim levels – LS, LT and Premier – and all the available packages, you could customize this car in multiple ways. Who doesn’t love a car that you could make singularly your own, without carbon copies of your car clogging up the road? Starting at only $15,420, the 2019 Chevy Sonic is surprisingly loaded with all kinds of features, including infotainment and safety amenities. Take a look at just some of these features, as well as a few other things that make the 2019 Chevy Sonic so special. When you are done, head over to Carl Black Chevrolet Buick GMC in Kennesaw and check out this unique vehicle in person. Nowadays, prospective car buyers spend a lot of attention on what their new car can bring them in terms of infotainment. We spend a lot of time in our vehicles, and we want to make sure we have some form of entertainment. This is even more true for our passengers. We have the road and all of its responsibilities to focus on. Our passengers quickly lose interest looking out a window. The 2019 Chevy Sonic features a 7-inch touchscreen infotainment center that is incredibly easy to use and navigate. On it, you can have access to not only AM/FM radio, but satellite radio, as well. The Sonic also has Apple CarPlay and Android Auto connectivity. So, regardless of where you stand on the great Apple vs Android debate, you can easily access iTunes, Spotify or any number of streaming music and podcast channels through the infotainment center. The 2019 Chevy Sonic also features Bluetooth connectivity and USB ports, so you can bring virtually any form of audio entertainment you want on your ride. One of the cooler aspects of the 2019 Chevy Sonic is that it has a built-in LTE Wi-Fi hotspot. While that in itself is not all that unusual in modern vehicles, Chevy will give you one free month of data through AT&T, up to 3 gigabytes. That means if you need to use your phone or tablet while on the road, for the first month you can save your own data and use 3 gigs of AT&T data on Chevy. Of course, Chevy’s renowned navigation and OnStar systems are also available through the infotainment system, as well. These features allow you to easily get to and from a place you are not familiar with. In the event of an accident, you can use OnStar to get in touch with the authorities. If the accident is severe enough, OnStar can contact the police and emergency medical services for you. These amenities offer a peace of mind that many drivers have come to rely on. You wouldn’t expect a subcompact car to be particularly roomy on the inside. After all, it isn’t even a “compact” car. It is even smaller than that! However, the 2019 Chevy Sonic might surprise you. The front seat offers 38.7 inches of head room and 41.3 inches of leg room. Those numbers won’t stand up to, say a Chevy Suburban, but they are great figures for a subcompact car. The front seat is roomy enough for just about anybody. The back seat is similarly comfortable. The rear seat offers 38.1 inches of head room and 34.6 inches of leg room. While not as spacious as the front seat, the back seat is still quite comfortable. The whole 2019 Chevy Sonic, which seats up to five, is a comfortable ride for all passengers, despite its status as “subcompact”. Additionally, when you aren’t hauling your friends around, and you need to get in a trip to the grocery store, the 2019 Chevy Sonic sedan offers 19 cubic feet of storage space in the trunk. That is well above average for a sedan, especially one in that size range. If you opt for the hatchback Sonic, the rear seat can be folded down to give you an astonishing 47.7 cubic feet of interior volume. That is well above some of the main competition for the 2019 Chevy Sonic, including the Ford Fiesta. So, if you frequently use your vehicle for lugging work or school materials or projects, the 2019 Chevy Sonic has more than enough room for you. The days of a driver being solely responsible for the safety of the vehicle and its passengers is long over. While it is still the responsibility of the driver to pay attention and heed the rules of the road, they now have a plethora of helping aids to get safely from point A to point B. These safety features have become more and more prevalent over the last 15 years, and they will continue to do so. As technology advances, automakers use this technology to keep drivers more and more safe. Chevy is no stranger to this way of thinking. They have implemented dozens of safety features into their cars, trucks and SUVs over the years and will continue in the years to come. The 2019 Chevy Sonic is a good representation of what Chevy has to offer in the way of safety features. Some of the many safety features available on the 2019 Chevy Sonic include Stability Control, which helps the driver correct if the Sonic begins to get out of control; Traction Control, which helps keep the Sonic stable on less than ideal road conditions, such as snow or gravel; Lane Departure Warning, which gives the driver an auditory alert if the Sonic begins to drift out of its lane without first deploying the turn signal; Forward Collision Alert, which will warn the driver of an impending impact at the front of the Sonic; and a Rear View Camera, which allows the driver to see the space directly behind the Sonic, which they might have difficulty seeing. These are just some of the safety features on the 2019 Chevy Sonic. It comes standard with some of these, while others are available on certain higher trim levels. 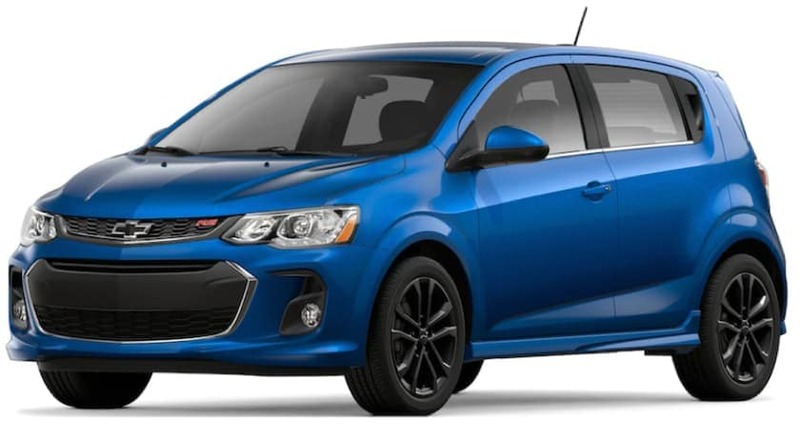 Unfortunately, the 2019 Chevy Sonic is believed to be the last Sonic that Chevy will produce. It is expected to be discontinued soon. The good news is, that while Chevy is still rolling them out, we are more than happy to put you into one of these amazingly versatile cars. If you are looking for a sedan with a respectable engine, great gas mileage and a ton of infotainment and safety features, look no further than the 2019 Chevy Sonic. If you are looking for a hatchback with all of the above AND nearly double the interior cargo space of a Ford Fiesta, the 2019 Chevy Sonic is definitely the subcompact hatchback for you. Stop by Carl Black Chevrolet Buick GMC in Kennesaw and take a look at one of these fascinating new cars. Our sales staff can show you all around the sedan and the hatchback. We can also go over each of the three trim levels and show you exactly which trim brings what to which body style. Our finance team can set you up with an affordable payment plan to get you into the new 2019 Chevy Sonic, and our service department can create a maintenance schedule to keep your 2019 Chevy Sonic running at peak condition for years to come. After all, you might not get another chance at one after 2019. If you can’t make it down immediately, check out our online showroom. It has pictures and specs of all of our vehicles, including the 2019 Chevy Sonic. We will see you soon!